Has anyone done a '05-'07 axle conversion in an '99-'04? I'm looking for some solid information on this kind of project. I've got a good set of parts lined up and I'm hoping someone has already done this successfully. The gain would be a coil spring front axle with a wider offset. Nicer ride. Turning radius. The project began on Saturday. 2 weeks ago I found a donor truck. 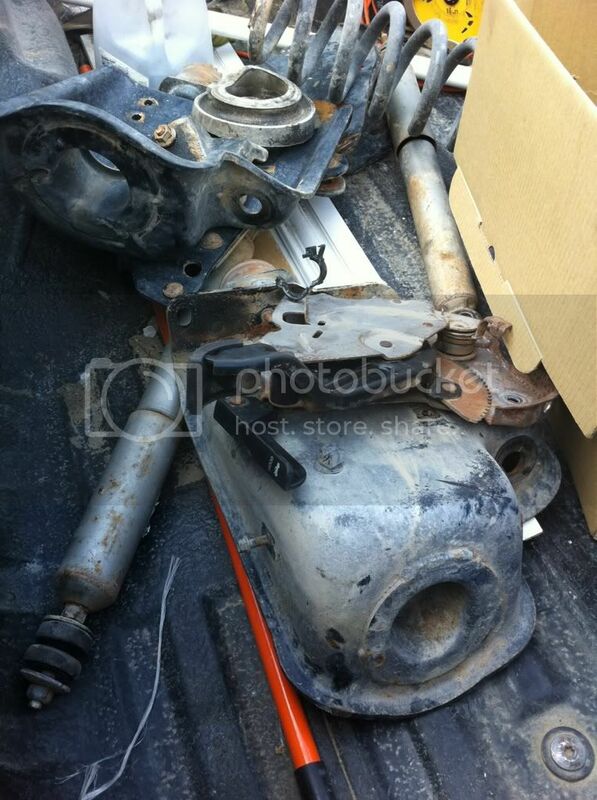 A 4wd 2006 F250 that had been stolen, engine and trans removed, and dumped. The salvage yard put an ad on craigslist so I boogied on out there. 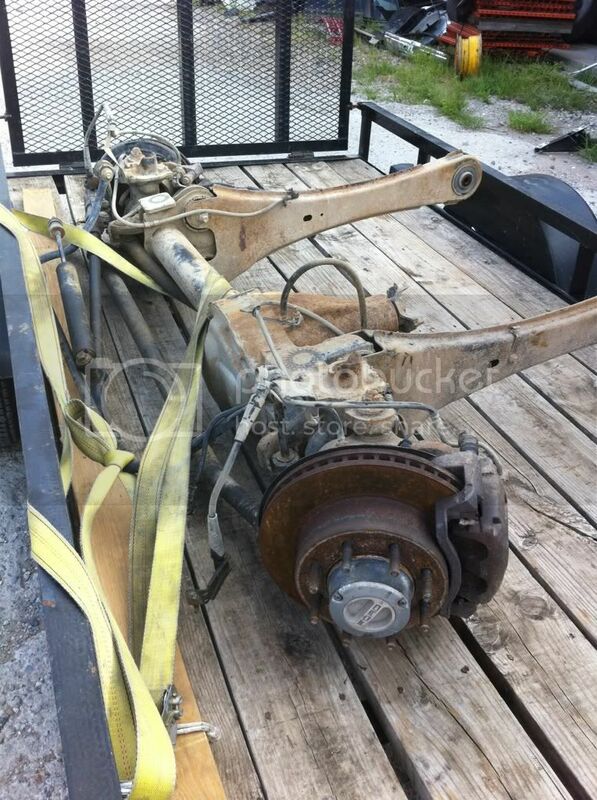 The yard was instructed to remove the axle (3.73 gears), radius arms, radius arm frame mounts, springs, spring buckets, shocks, track bar mount, and steering stabilizer mount. They were further told to not cut any brake lines, electrical wires, or vacuum lines. And asked to collect all bolts removed in the process. The rear axle came out and went back in with hardly a problem. The yoke from the original 2000 axle didn't match the 2006 axle so we swapped them instead of modifying the driveshaft. The abs sensor in the pumpkin didn't match on the plug in side so we swapped them. Shock mounts and sway bar hardware mounted up. New axle mounted with the 20" wheels. Last edited by vegoilrecycler; 07-24-2012 at 03:18 PM. I took my original leaf springs to a spring rebuilding shop in Ft Worth for a re-arch and they added two leaves while they were at it. $275. Hopefully this will give me the height I need to match the height of the front end for a level or mild rake ride. If the rear is still lower, I'll be buying lift blocks. New front and rear shocks were purchased. ProComp MX6 adjustable ride monotubes are about to go in tonight with the re-arched rear leafs. I also picked up a ProComp steering stabilizer shock to replace the worn out old one. The rotors are being turned. EBC Yellow Stuff brake pads are going in too. Last edited by vegoilrecycler; 07-24-2012 at 03:19 PM. I was really nervous about the front end swap. From i-beam to coil spring. But so far my concerns were not substantiated. With the old suspension in place, the radius arms and I-beams were unbolted from the frame mounts. Springs and shocks and the whole nine dropped right out with the hubs. The radius arm frame mounts came out with bolts but the spring buckets were another story. With 6 rivets in place, those were a project in themselves. Grinding, torching, and air hammering was required to get those knocked out. New spring buckets from the 2006 lined up with existing holes in the frame. 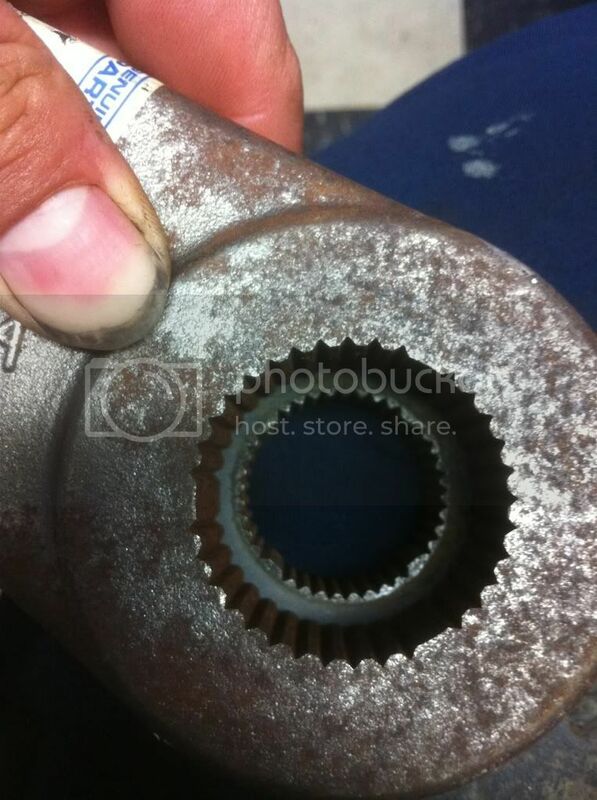 So new grade 8 fasteners with locktite are holding them on now. Next came the radius arm frame mounts, track bar mount, and steering stabilizer mount. For the radius arm mounts, they bolted right up to existing holes. 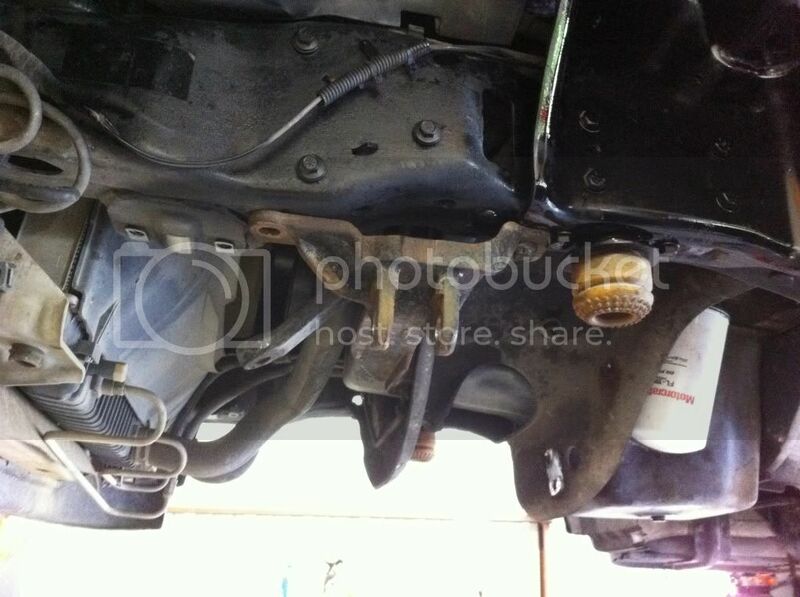 The steering stabilizer and track bar mount needed new holes drilled in the frame but these were easy to locate. Mating the pitman arm to the drag link presented an issue. The diameter of the 2006 drag link end is larger than the 2000. We looked as swapping the pitman arm in from a 4wd 2000 and it doesn't fit either. 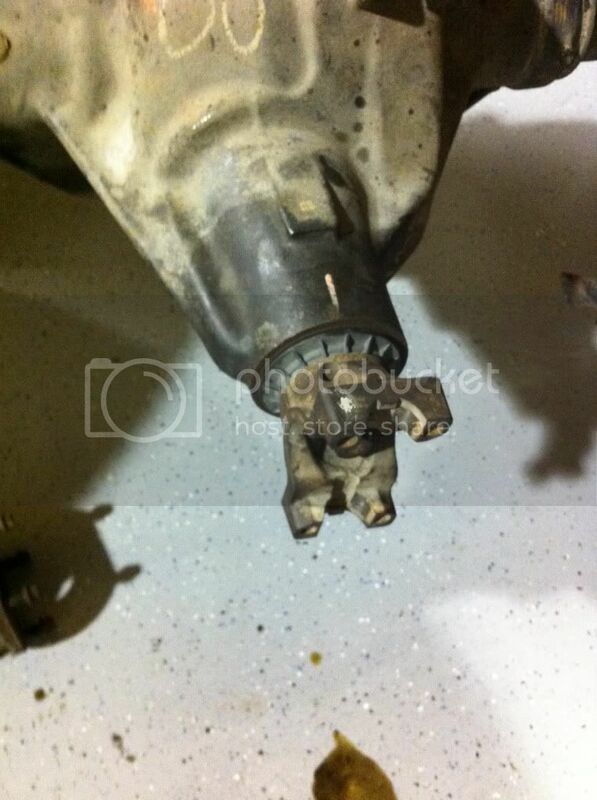 A 2006 pitman arm won't fit on the steering box because the teeth pattern isn't the same. See the overlapping parts for comparison. So the solution we found is to ream the hole in the pitman arm. Snap on sells a tool (#r121) which has the exact taper that we need to cut the hole just a little bigger. And the difference in size between the two is very small. But just different enough that they won't fit together. The only remaining issue is mating the brake lines together. The rear went in place like it belonged. The front brake lines required a tiny modification to fit and stay out of the way of rubbing on the tires. The front end sits much higher now. I'll have more pics after tonight's work. Stay tuned. I wouldn't go through the trouble for coil springs or turning radius, but I've heard the brakes will be an upgrade - that's a plus. Call me sentimental, but the LAST thing I'll be swapping out on my F350 is the leaf springs. In an accident, or on a really bad day off road - I'll trust the strength and safety of a slab of steel anyday, over some little stamped notion someone stuck a bushing in. you obviously haven't driven a newer super duty...I have thought about this several times just for the turning radius...my 05 super crew will turn circles around my 99 reg. cab, and the ride is so much better!!! Thanks for the info and all the great pix. I'm sure you will be happy with the results. check out the 05 in my sig if you think the coil setup is weaker. It has been through alot and has 348k on the clock. While I am not sure the work is worth the payout, I can appreciate wanting to mod your truck to your taste. 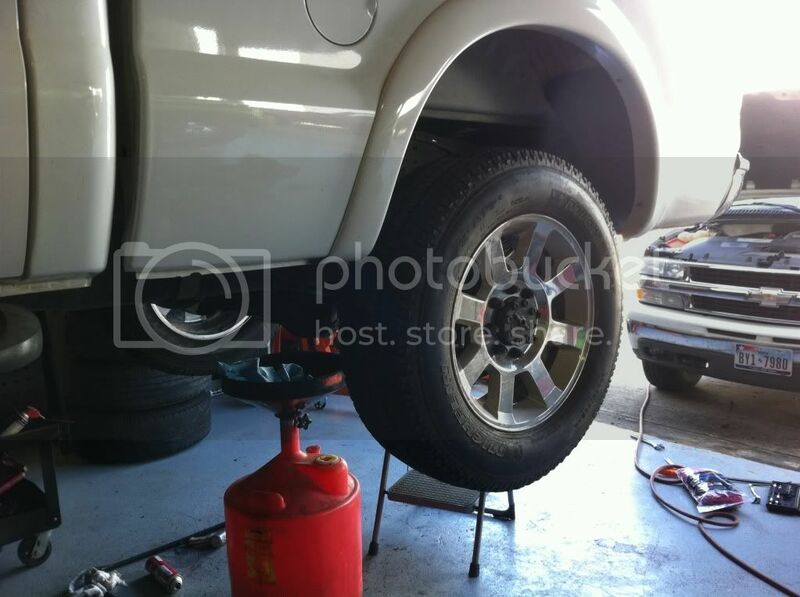 Plus you get to be some what of an expert on the 2 different styles of suspensions and brakes during the process. I have a 2002 F250 4x4 supercab and a 2008 F350 crew cab 4x4. The 350 definitely rides better, but the 250 has a better turning radius and feels like it handles better. Even if I got the parts for free I don't think I would go through all that work. Another draw back is that lift kits are more expensive for coil spring suspensions. Now I would like to swap a 2005 style front grille and bumper onto my 2002. Veg, I'm impressed with your taking on this project, but I'm confused: the picture of the white truck on the lift in #8 looks nothing like the 2000 in your sig - badges look like an '03 or later 6.0 truck. I thought you were mounting '05+ axles on the 2000? 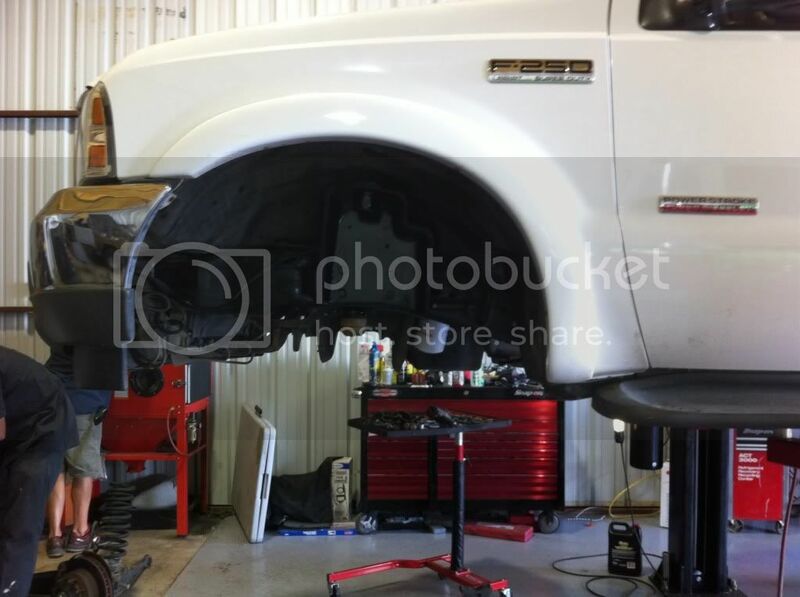 Or is the truck on the lift the donor? 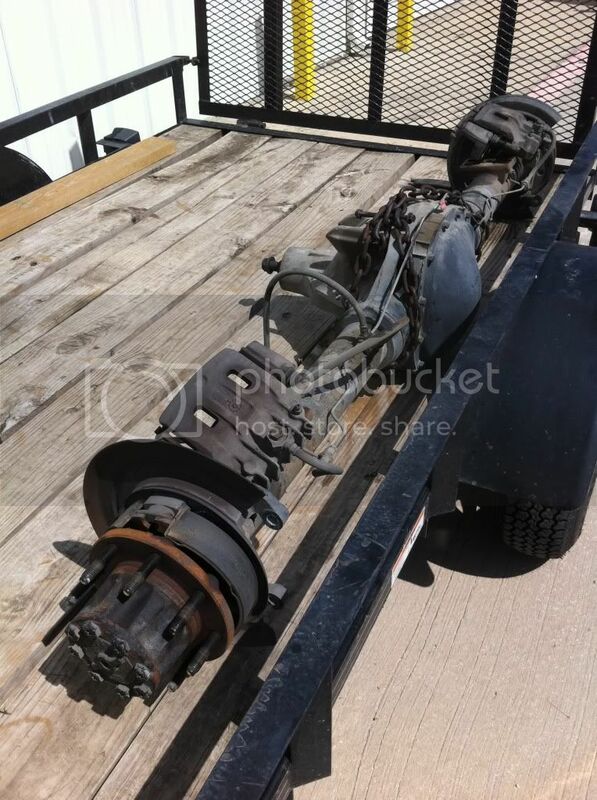 It looks pristine - why not buy the donor and mount your 2000 7.3L/ZF-6 veggie set-up in it? 2002 F350 Supercab Lariat 4x4 7.3L 6 spd. B&W gooseneck, Prodigy brake controller, PAC exhaust brake, WARN manual hubs, Ford AIS, Bilsteins, Michelin LTX, Line-X bedliner, 203F t-stat, Cat ELC coolant, by-pass coolant filter.